I then checked the actual forum post and noticed he got around to editing the self-inflicted trademark infringement to "the Ur-Quan story"
This was back when no lawyers were present to scrutinize everything so that was understandable. Out of curiosity since this sort of thing isn't new by any stretch. When you see a publisher or a Kickstarter announce that their team includes "ex-members of Mythic Entertainment" are people still gullible enough to believe that this is the next game from the creators of Dark Age of Camelot? I mean that's certainly what the marketing implies and I must have seen headlines that say as much after such announcements some 50+ times and probably all for different projects. Seriously it feels like there was a point in history there were ex-mythic team members were the town bicycle. Every new startup dev team got a ride. I'm also curious when people see "Sid Meier's Civilization VI" who do they think has the most say in what the final product is going to be? Him or Take 2 Interactive? Also how much blame to give to Will Wright for Spore over Electronic Arts? I don't even want to go into Richard Garriott and how he goes around claiming he basically created, well indirectly nearly everything... But man if there was ever a high profile example to counter Frogboy's argument people in the industry don't usually go around calling themselves the creator of something when much of the end product is dictated by the team working under them... I mean I can't think of a bigger example of a developer that adheres to "game design by democracy" philosophy of design then him. He is so easily swayed by every suggestion his team throws at him nothing he's produced in the last 3 decades could be said to close to his exclusive vision. But if you ask him, he still created it. But the crux of why I have to disagree with Frogboy on this point is this is normal. Not just in game design either. The designers are almost always credited as the "creators" no matter how big the team. How many people at Nintendo do you think worked on the original Mario Bros and Zelda games? I'll give you a clue, even the original Donky Kong had more than a single handful. But ask anyone who the creator of those series and characters are and you'll always get the same answer, Shigeru Miyamoto. Maybe if someone is particularly well versed in Nintendo trivia they'll say Shigeru Miyamoto AND Takashi Tezuka for Zelda. A game which was their spin-off derivative of Ultima 3/Dragon Warrior. Ignoring the larger company and the hardware development behind those titles on just those dev teams you have producers above them, you have programmers below them, sound designers besides them (later on artists to). But who are the creators of the games? Those guys. Why? They are the designers. As far the public (and frankly I would argue the industry too) are concerned the designer create the game world. Everyone else on the team builds their creation. They are the architects who's (whom's?) vision is enacted. I think this is the crux of the backlash Stardock is facing for the decision to call them out for calling themselves the creators. Sure they aren't the sole developers. But no one in their right mind would assume that anyway. You would be super hard pressed to name anyone other than Chris Sawyer who has anything resembling a claim to soul developer of any majorly successful game between the start of the 80's and the recent rise of the indie in the last decade in the wake of digital distribution swinging open the gates for them (and I'm pretty sure even he had a friend do the music). They are still few and far between. I can think of maybe 5 off the top of my head, out of the flood of thousands of indie games we've seen since then. So the fact the P&F aren't the sole developers, while it might be news to many, surprises nearly no one. But even in the wake of that knowledge knowing they were the designers, very very VERY few people would dispute their right to claim they are the 'creators' of the series. That is madly pedantic and highly debatable. That's why there were articles popping up stating you'd gone crazy and why to the public it looks like you are grasping at straws. The public just will not see it your way. Amongst your sea of reasonable claims that's just reductum absurdum. It's also not particularly relevant to a licensing dispute as far as the public is concerned. Most people understand when a developer creates something under a publisher the publisher owns the rights and can sell on the license separate to the developer leaving the developer with no claim to the license. But that in no way makes them any less the creators of it nor diminishes their right to show it off in their portfolio when they go off to work for other companies or market their own future products. Now that said if what I'm reading here is anything to go on, P&F have been making many more even crazier claims/demands. But these are probably not the correct forums to be offering them criticism and incite to how that's perceived. Seriously, I would to know exactly "how" they expected you to police fan creations. Like what process did they imagine there? They haven't been inactive in the industry they must surely be aware of how that usually goes down so I'm genuinely curious as to what exactly their expectation was. Unless they just made the demand to be difficult in hopes of forcing you to reject their demands. Or that was the decoy demand? The one they'd hoped you'd negotiate away in exchange for accepting one of the other ridiculous ones they actually wanted? That is by far the most insane thing I've seen come out of this spat so far. Chris Roberts refers to himself as "the creator of Wing Commander." Underworld Ascendant is from "the creators of Ultima Underworld" (not Richard Garriott, Underworld was a spinoff series). Phoenix Point is from "the creator of X-Com." I really don't understand why Stardock keeps insisting on this. The deal they signed for SC3 referred to "characters created by Reiche", and I believe the SC3 packaging says something similar. Accolade had no problem saying this, while the complaint says in paragraph 50 they "may not have...substantially contributed to the authorship of the game." In fact, Stardock's suit doesn't even give Reiche and Ford credit as the designers, merely says they "contend that he/they contributed certain undefined material and/or programming." This goes way beyond technical legal talk about creator vs. designer. Stardock might actually be legally right about the "sequel to Star Control" line overstepping boundaries, but the "creator" one is less defensible and isn't doing Origins any favors, especially when Greg Johnson (who worked on the game) says "creator" is an appropriate description. And if you want a settlement, Reiche and Ford are probably reading this - doubling down on the point that seemed to really make them mad can't help lower tensions for the negotiations. From a consensus point of view, I suspect most people at this point do believe they “created” Star Control. That doesn’t make it a fact and legally they absolutely didn’t. That is certainly something they could negotiate for if they want to promote themselves in commerce as such. As for lowering tensions, you have got to be kidding me. I realize, Joel, that you are their advocate here but they have been personally attacking me publicly for months. We already tried to negotiate a good faith coexistence agreement. And we got insults and abuse for our troubles. We are confident that the courts will succeed where my persuasion has failed. From a consensus point of view, I suspect most people at this point do believe they “created” Star Control. That doesn’t make it a fact and legally they absolutely didn’t. I think you forgot the "IANAL". 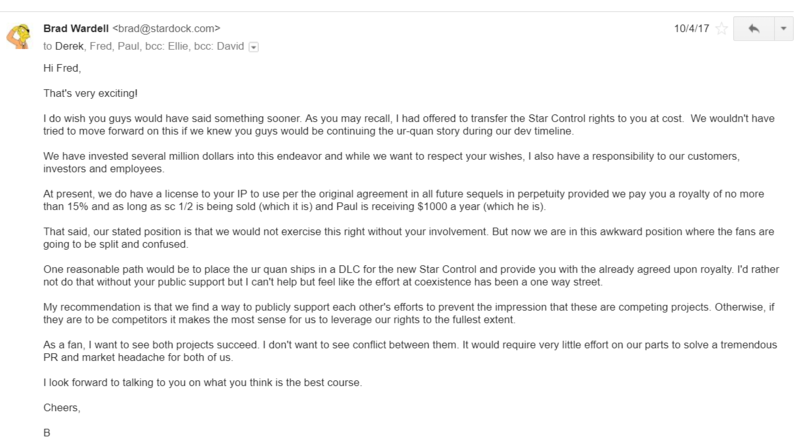 "Legally, P&F may have created Star Control, but they are not allowed to promote themselves in commerce as such without Stardock's permission as the trademark owner". My understanding (and IANAL) , is that there's a difference between the act of having creating something (which is more of a copyright concept), and the legal right to use its name in commerce (which is a trademark issue). If I'm correct, then the problem with the first statement is that it conflates the two, and thereby seems to question the act of creation, rather than being focused on the right to use the creation's name in commerce, which is where Stardock's legal argument is strongest. This is why arguing what lawyers put in a legal complaint is pedantic. Either Paul and Fred don't understand the law or they purposely chose to misrepresent a legal position with an vaguely defined public sense of "creation" in order to gin up outrage. If the lawyers were trying to offend, they could have referred to them as disgruntled Accolade contractors. I think the argument of whether or not PR&FF were the creators of SC1-2 can be easily solved by evidence and testimony from the team that developed both games. Greg Johnson already made his (assuming the guy that posted wasn't an impostor) and many others could come forward and provide insight into the creation of the games some 25 years ago. As for evidence, I think PR&FF can easily provide this. However, legally (and IANAL, to borrow Elestan's acronym) the creator title is useless and all boils down to proving the 1988 Agreement between Accolade and PR as "bogus" or "illegal" for Stardock to stay in the fight. 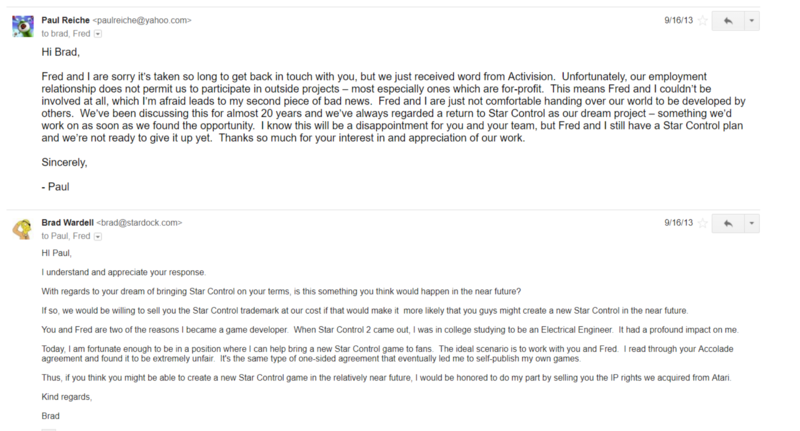 Even if every single person signed an affidavit claiming that P&F literally did everything, it wouldn't make them the creators of Star Control in any legal sense. Read Exhibit A of their counter-suit. It's a licensing agreement. Even if they made 100% of the licensed content it would only make them the creators of the licensed content that went into Star Control. Not Star Control itself. License agreements are very common and are done for the very reason we're arguing now, to ensure that the fame and reputation of the product remains with the product and not the people who made the content. Now, by contrast, PUBLISHING agreements do exist. Stardock and Ironclad work together under a PUBLISHING agreement. Ironclad created Sins of a Solar Empire. They own Sins of a Solar Empire. Same for Offworld Trading Company. So what's the bottom line? Trying to convert legal terms to layman's terms is pointless. And it's pointless because it's not what the suit is about anyway. That's an interesting argument, and I think it's the first time I've heard it articulated this way. If I understand it correctly, you're splitting the product identity of "Star Control" from the identity of the game that most people think of when they talk about "Star Control". Which does make a certain amount of sense, given the way the IP rights are split up. 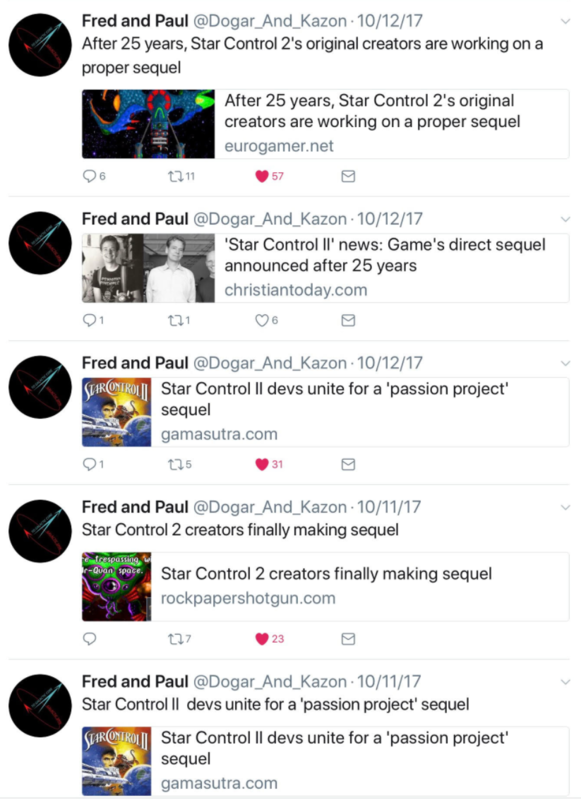 So using those definitions, I think I would agree with you that Paul and Fred might not be the legal creators of "Star Control" (the product identity). The first problem is that because this is a very fine legal distinction, just about everyone (probably including Paul and Fred) who hears you talk about P&F not having created "Star Control" is going to assume that you are talking about the game itself. If you were careful to clarify the distinction when making such statements, you would probably not set so many people's hair on fire. 50. 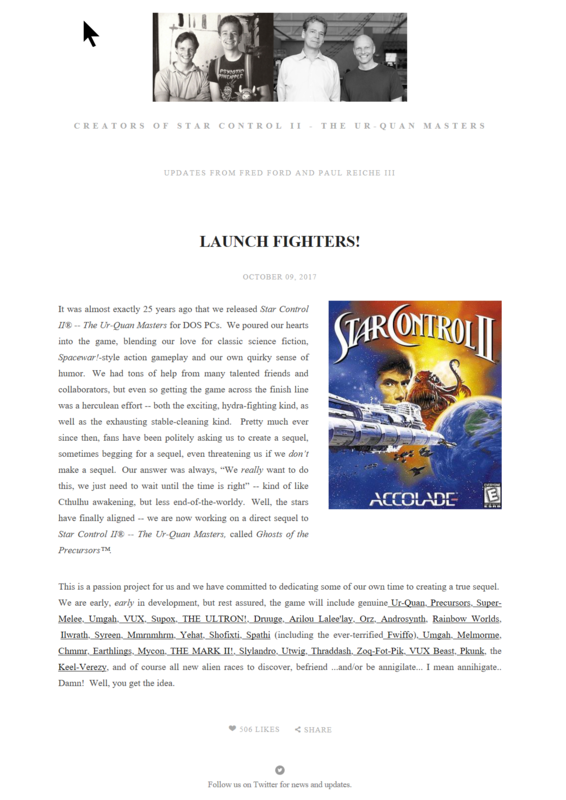 Upon information and belief, and contrary to the common public understanding and what they have portrayed to the public, Reiche and Ford may not have created any of the artwork, animation or characters incorporated in the games, or otherwise substantially contributed to the authorship of Star Control I and Star Control II. That claim is directly contradicted by Greg Johnson's statement. Moreover, Paul just posted one of his design noteobooks, which pretty clearly shows the genesis of many ideas that eventually went into the game. That is why they are being asked to get those notebooks to demonstrate their contributions. It doesn't say they didn't do X, it says they may not have as in there is no evidence. Now they will provide evidence. And if they do show that evidence then they will have successfully shown they substantially contributed to the licensed work. However, that doesn't change the fact it's licensed work. From a lay person point of view, I have for years considered them the creators of the game. But when push comes to shove and you're trying to use that in commerce in a hostile way, then the lawyers are going to point out that, yea, no legally Accolade created it. You guys were the ones contracted to produce content to be licensed back and put in. In short: If a journalist (or me or Greg or you) wants to call them the creators, that's one thing. But to promote yourself that way while engaging in commerce? No, you need Accolade->Atari->Stardock's permission. Permission Stardock was willing to give prior to all this mess. When it comes to the legal definition of who created Star Control, there is no question. It's Accolade. That's the lawyers talking, not me. We lay people may object to that but it is what it is. It was a licensing agreement. They were paid to create content for Accolade's product and they did. During that same (early 1990s) period, Stardock made a product called OS/2 Essentials. Who created OS/2 Essentials? Stardock. But we didn't create any of the licensed IP of it. And none of those IP creators would be able to go and claim to be making a sequel to OS/2 Essentials simply because they licensed content to it. Nor would they be able to promote themselves in commerce as the creators of OS/2 Essentials without coming to some understanding with us. At this stage, it's an academic exercise. I'm pretty much speculating as much as you are as once it got turned over to the lawyers, my involvement pretty much ended. 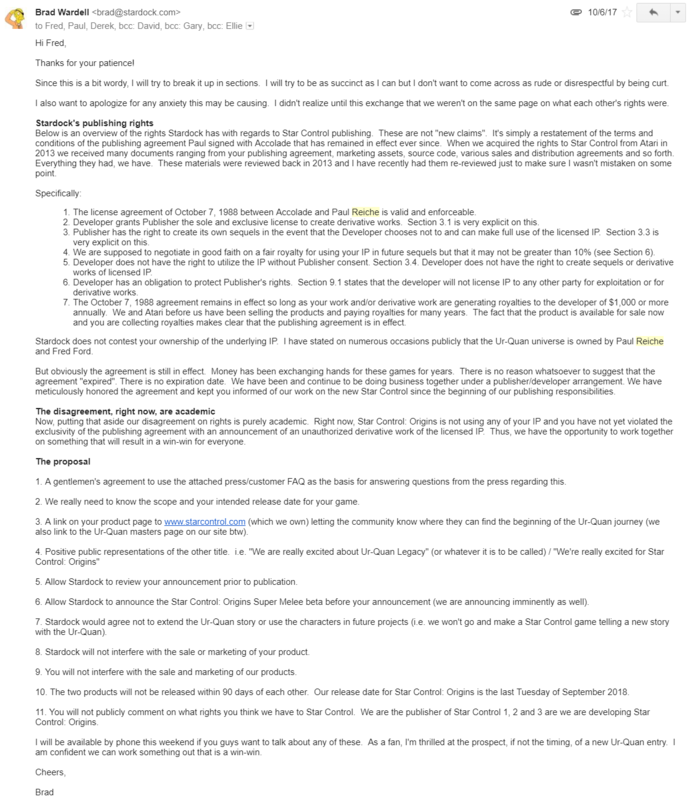 But I have dealt with a lot of these kinds of licensing agreements over the last 25 years. Unless you're going to argue it wasn't a licensing agreement, despite it clearly being one, Accolade was the creator of Star Control and PF and friends were the creators of whatever they created and licensed to Accolade for inclusion. I think Paul & Fred "created" the story and the characters. The game was nothing new. Just as Master of Orion was two of three components of the "fully interlinked Star Fleet Universe" (SFB/tactical & F&E/strategic), Star Control was the same exact thing (SFB/tactical & Prime Directive/RPG). Like almost every space/sci-fi game in existence, it was ultimately based on the Star Fleet Universe. This is very obviously the case from the structure and content of the game. So, really, Steve Cole and Gary Gygax "created" the game... and if you are going to imitate other designers those are two pretty good ones to borrow from. Then, of course, like anyone's story their story is derived from past sci-fi stories. I'm not trying to take anything away from what they did, only pointing out that they did not "create something entirely new", they "arranged and composed" previous things into something that suited their taste and style. They are going too far when they try to make it sound like they came up with this "amazing thing" from scratch, and that way of thinking will lead them into taking unreasonable positions in this dispute. Since they do appear to be attempting to take too much credit (Example: They had almost nothing to do with "creating" Super-Melee. In fact, *I* had more to do with "creating"their Super-Melee than they did!) 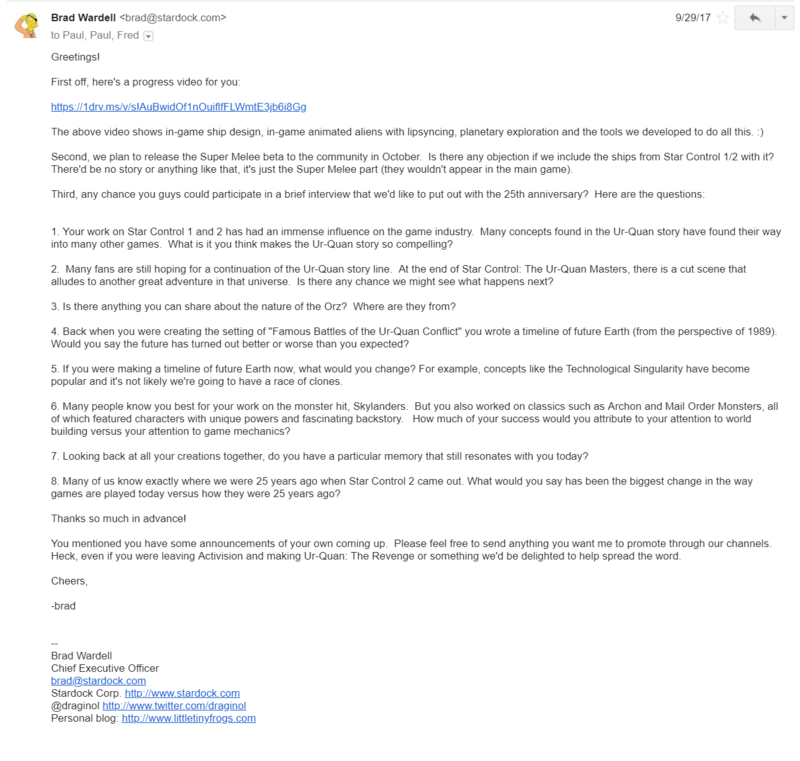 it is not unreasonable for Stardock to be questioning what their actual contribution was. It's their story, and their characters, but it wasn't really their game. They certainly weren't the "creators of an entirely new and unique thing" like many seem to be making the situation out too be. It is human nature to want to put things into a neat little box, but things almost never fit into a neat little box. And this causes humanity as a group to mislead itself about a great many things. The universe is a great example. People like to think that we have a good understanding of the universe, but we don't. We actually know almost nothing of the true nature of the universe. We are very primitive. Much of what you think we know about the universe, we don't actually know. We assume, and the public thinks those assumptions are knowledge, when they are actually just guesses. A perfect example is planets. Most people think we've known that the galaxy is filled with planets orbiting stars for centuries now. In reality, until very recently we had no idea that any planets existed outside of this solar system. That was only confirmed about 15 years ago. That is how little we actually know about the universe, how primitive our knowledge actually is. Very often, because humans have a natural tendency to want to think that they fully understand things and put everything into a neat little box with "solved" written on it, we very often assume we know a lot about things that we actually know almost nothing about at all. Like how you have probably always been certain that we knew about planets outside of this solar system since long before you were born when, in reality, that has only been confirmed very recently. Prior too that, it was actually just an assumption that very easily might have been proven wrong. I dunno about that. By that argument, everything is derivative. All games borrow and Star Control was no different. But it was greater than the sum of its parts. I think almost everything is derivative, except what little you wind up actually evolving from yourself into your arrangement of it. I'm not saying they did nothing, just that if they were to really think about it very little of what is in it actually came from them. Just like it is for anyone who tells a story, makes a game or movie, or anything like that. I don't know what or how P&F are thinking, only how people are presenting it in this forum. Based on that it seems too me like P&F might be thinking like I did when I was younger, that I had come up with a "very original" story in the original Pirate Dawn/Manifest Destiny story that began my own "universe". Or that Territories was all my idea from having played with poker chip prototypes for years to arrive at it. One day somewhere along the way I started to really think about how much of that was really coming from me, and really it is almost none of it. The story is a blending of everything I've ever liked that is relevant too it. Territories is really mostly making Robert Simpson's MegaSupremacy run on Steve Cole's impulse chart. There is a little bit of me in it here and there, and I consider it to be "mine" because of that, but almost everything is just building on other people's previous work. And it is the same for everyone, it evolves at a crawl through generations we only add a tiny bit of ourselves too it as we re-do it again. I would just hope that P&F would be thinking this way, and not caught up in the idea that it all came from them. It makes you really dig in against any compromise if you are thinking about your game/story/movie in those terms. Legally, the writer/creator/designer/company does own each new iteration of the same old stuff that can trace itself back to Shakespeare. But the people who "create" this stuff should always remember that, if they really think about it, very little of it actually originated with them. Interesting but one point of curiosity, since nearly work in all industry, is done under larger companies who ultimate own the resulting body of work. How do portfolios and accreditation, previous work references etc. all factor into this "promote yourself that way while engaging in commerce"? Such a huge number of games both crowd funded and otherwise are marketed by what the team members previously worked on regardless of who they worked under. Even if nothing is volunteered in the initial sales pitch the first question is who are you people and what have you previously done that demonstrates your ability to deliver on this new product? I mean I personally have backed over 400 crowdfunding projects (not even exaggerating I've got over 200 on kickstarter alone) and given almost every pitch is "X is a new game from the creators of Y" I'm baffled I've never seen something like this come up before. I mean EA are the license holders of 2 out of 3 of the highest profile "from the creators of" references in crowdfunding history. They love throwing their lawyers around and we haven't heard a peep. I'm not saying you are wrong I'm just amazed. The closest precedent I can think of for something like this is Konami preventing Hideo Kojima from accepting his Industry Icon award at the game awards and both the gaming community and the industry utterly castrated them for it. I mean just google Metal Gear, everyone knows it was created under konami and they own it but in every listing and every documentation, you will find Hideo Kojima credited as the "creator". Listing the designers as the "creators" in any credits is the standard for pretty much every game in every corner of the industry, even from companies now famously oppressing said creators. I don't know what the legal strength of the argument is, not a lawyer. But man you've got to wonder if whatever legal edge that statement has was weighed against the obvious potential PR disaster here. So I guess what I'm curious about is with billing yourself as the creator of something you created under contract being the laymen's standard for filling out your resume, what's the exact line you have to cross in "commerce" where it stops being an acceptable laymen statement and starts being a legal no-no? Dining out on free meals with an ego resume is one thing....stopping an actual owner of a product from using it is another. You can be the mastermind behind something....and reference it in a resume.... but that does not mean at any time in its history did you necessarily ever actually OWN it. Specific to Stardock....I was one who [mostly in the early days] skinned a product called 'Windowblinds' .... even was mixed up in doing things with the program the author of it was surprised that it was capable of doing. I could bandy that around as "gee...look at me...I'm clever" ... but it nowhere means I ever actually owned anything about the program....at all....zip....nada....zero. I feel the bolded text above is the core reason for this dispute. From PR&FF's perspective, they didn't need to own the SC mark since they believe it wouldn't stop them from creating GotP. 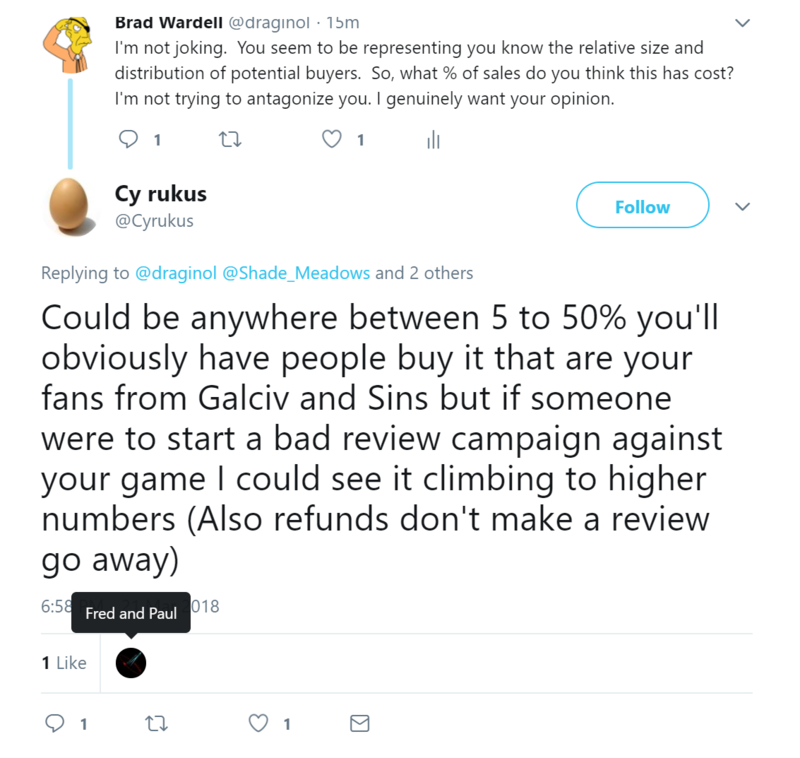 However, Stardock's offer (above) left a bad impression on PR&FF since Stardock made it appear that in order for PR&FF to move forward with a 'sequel' without any legal ramifications, they would have to purchase Stardock's SC assets. I believe this started PR's distaste for Stardock even back then, even though misplaced, since it was clear Stardock was willing to sign a written agreement just so both games could get made. 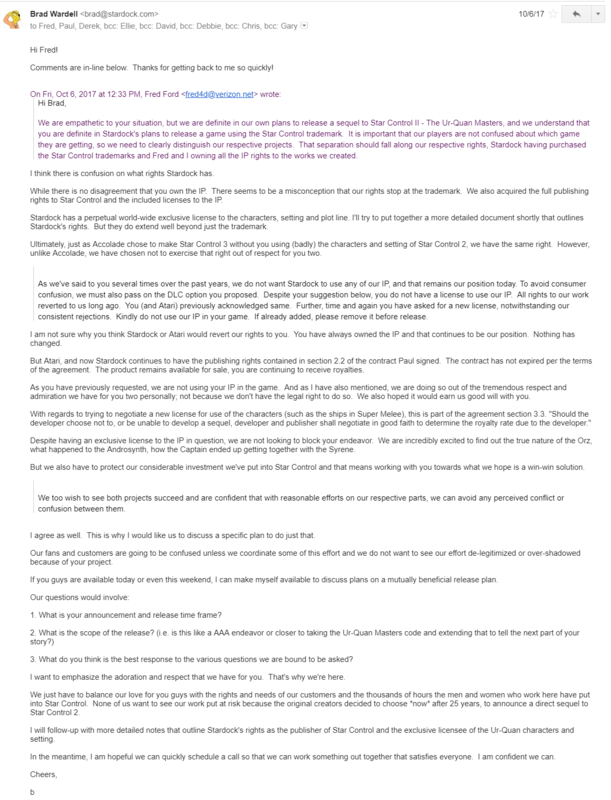 That said, I have a question which I believe hasn't been asked and is not included in the Q&A post: What is Stardock's position on PR&FF's claims that all rights to the Classic SC Games IP have reverted back to Reiche in April 1, 2001 when Accolade failed to make another Star Control game since 1998? Could they have done GotP without violating our IP rights? Sure. But not as a game related to the Star Control franchise. Would I, as a super-fan, have been willing to set up a really friendly agreement to ensure they could do the game as a continuation of SC2 back last Fall? Probably. But that ended when they sent the lawyers. I realize some people think of this as some sort of academic exercise. But for us, it's not. We have invested millions of dollars and four years into Star Control. Even now, our internal build is probably the best thing we've ever made. 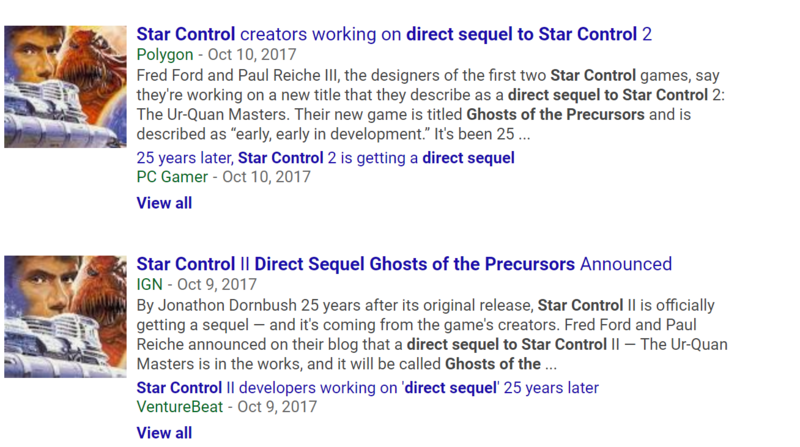 Unfortunately, our ability to market and promote the game has been severely damaged because every article wants to talk about either A: How it relates to Ghosts of the Precursors (or at least mention them) or B: About how "The Creators of Star Control" are mad. We have no choice in this matter. For us, it's a matter of the livelihoods of the 100+ people working here at one of the oldest and last major independent game studios. Most of the litigation I've been involved in has lasted years per case. This will likely be the same here. We don't like it. No one does. But we cannot take the chance that our hard work is going to be either delegitimized or sabotaged via a DMCA because PF think that they have some right to some element in our game. But we cannot take the chance that our hard work is going to be either delegitimized or sabotaged via a DMCA because PF think that they have some right to some element in our game. Our complaint isn't about the distribution of the classic DOS games. It is about their trademark infringements. It seems to me that their trademark infringement is only half of your story; it's your primary offensive legal war hammer. But it seems like your litigation goal is to use that weapon not only to avoid market confusion with your mark, but also to try to force them to give you enough of a license to their content to immunize SC:O from legal threat from their copyright. F&P's situation is the reverse: Their sword is their copyright, and their goal is to immunize themselves and GotP from your trademark threat. Meanwhile, you're both wrestling over "The Ur-Quan Masters" trademark like Kirk and Khan over a phasor pistol, while trying to break each others' respective legal weapons by questioning authorship, trying to find holes in contract language, or pointing out potential expirations in trademarks. I've now got quite a metaphorically cinematic scene in my head. It would be funny, if it wasn't so sad. It is strange that there has been 0 info on GoP game since the announcement. Are F&P developing anything at all? Unlike Stardock, which has a bunch of hired developers, my understanding is that F&P aren't making GotP with their company (Toys for Bob); it's just the two of them to start with. So if the lawsuit is tying up some or all of their time, it's going to have a greater impact on their schedule than it does on SC:O.
Additionally, making a game takes a long time. Stardock bought the SC trademark back in 2013, so it's taken them several years to produce SC:O. F&P are still in early stages for GotP. What I would hope to see next from F&P is an announcement about the team that they are no doubt assembling behind the scenes to work on the game. Will Riku Nuottajärvi and The Precursors be doing the music? Will Erol Otus be involved in the art? Will Greg Johnson be involved? Will any other members of the original team be returning? Once the leads are in place, they'll build out the rest of their teams, and then they can start work on the game. I'm not convinced there's even going to BE a GotP. It's been 25 years, you might think they might have found some time in the last 25 years to doodle at least an idea or two about a possible next game on a napkin. But no, there's nothing at all, they have literally not started a single thing for a sequel/new game, and yet chose to jump in with their threats and lawsuits right as SCO's hype was starting to get to decent levels (and have managed to curtail that very effectively - nobody in the gaming press or community are talking about SCO, they're all just talking about poor Fred and Paul). At this point, it seems to me like there's a strong possibility that there is no GotP, and never was going to be, but this whole exercise gives them a great excuse for that. "Oh, we were GOING to do a sequel, and it would have been awesome. But mean old Stardock wouldn't let us and brought lawsuits against us. It's all their fault". They get to be martyrs while having done literally nothing towards a new game, and they get to (try to) kill SCO for daring to want to follow in their footsteps. 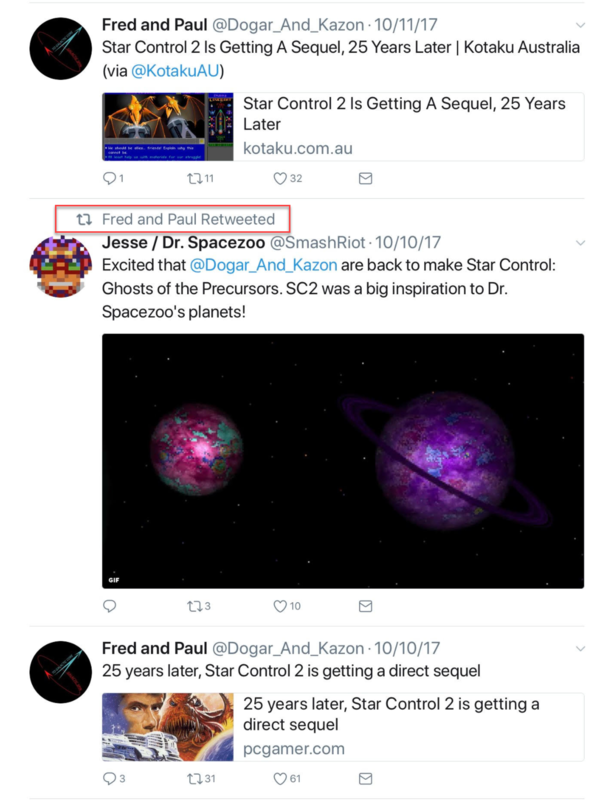 I've been a huge fan of Star Control and Paul and Fred for many many years. SC2 is my 2nd favourite game ever (after Starflight), but I've had my hero worship crash down to earth over this. I hope I'm wrong, I really do. I call complete and utter bullsht on P&F. I personally think they are cashing in on SD's hype and as jealousy would have it, have zero plans on doing a 'true sequel' to Star Control. So Ill say it as a non entity not even knowing these people, LETS SEE SOME NOTES, SOME DESIGN CONCEPTS< SOME NEW STORY SNIPPETS. I never played SC or SCII. From where I sit it fully seems like these guys are simply trying to be martyrs to their fans. My only thought amidst the chaos is these games better be godly for all this sh** to be worth it. So it seems like you're essentially saying that F&P have no intention of making their own game, and are purely acting out of spite against Stardock for daring to buy the SC trademark. That seems like a particularly cynical view, and I don't see the evidence to support it. F&P have been clearly stating their desire to do a sequel for over a decade, including kicking off a petition to get Activision to let them. Just because they haven't posted their ideas doesn't mean we can or should assume they don't have any. And they're perfectly within their rights to not share their ideas yet; I actually don't want them to over-share, because I want to enjoy some surprises. I've been critical of some of Paul's actions (including an apparent lack of forthrightness to Brad) in other posts (here and elsewhere), but I want to keep any criticism focused and fact-based. The demonization of either side in this disagreement just stirs up tempers without accomplishing anything useful. Let's try to stay positive, giving everyone the benefit of the doubt where we can, and hope that the two sides can work something out and get back to making the games. Oh, I don't get an opinion? I should just use yours?